Introduced to the world of gaming in 2014, Raging Bull casino has got its fame for the number of games it offers. 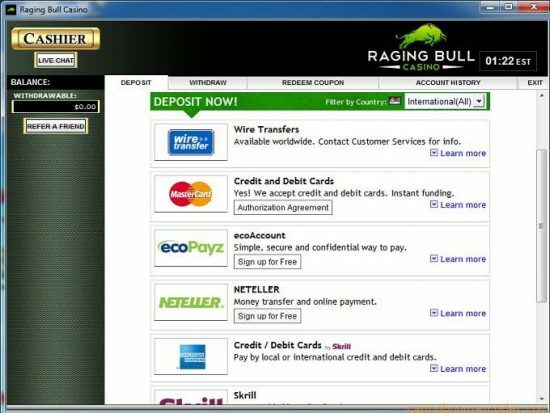 Powered by renowned Casino software developers, Real Time Gaming (RTG) Raging Bull is registered with authorities of Curacao. RTG has been providing players with games that are easy to download and play. You can enjoy the same with raging Bull too. Enjoy from a library of 200 plus games and play them either online or with mobile devices. However, there are few countries like Poland, Nigeria, Russia and others where you cannot play this Casino. The full list is available at the website. 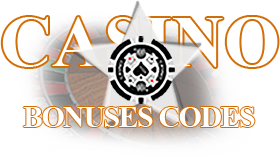 While playing online casino, the better are the bonuses, the more exciting will be the games. In raging Bull, the list of bonuses starts with free no deposit bonus of $50. This is just the beginning. They will offer you 300% bonus on your first deposit that is limited up to $750. They celebrate occasion with you and on your birthday you will find a bonus of $100 added to your account. Another $100 is added on their birthday. Raging Bull reward their loyal customers with royalty bonus where they give you 100% match bonus every month with a maximum limit of $500. You will also be able to claim cash back bonus of 15% of your losses from games played last week. Get free spins and other match bonuses on every Thursday. Thus, all you need is just grabbing the bonuses while you play at Raging Bull Casino. When you start choosing games in Raging Bull, you will have option to choose from more than 200 games. 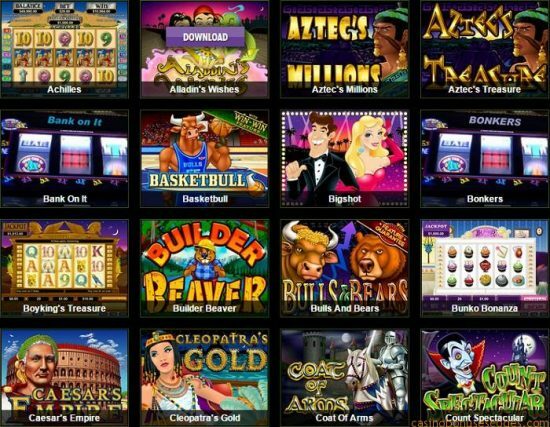 RTG has added their best games ever released in this casino. Whether you look for Blackjack, table games, Video Poker, Roulette, Keno or Bingo you can play them all. All the games are marvelous and addictive. In slot games too you can play either progressive slots or bonus round slots, 3 reel slots and many more. The graphics is just good enough for you to enjoy the games without any pause. And why just play this games online, enjoy them while you are on the go with mobile raging bull casino. 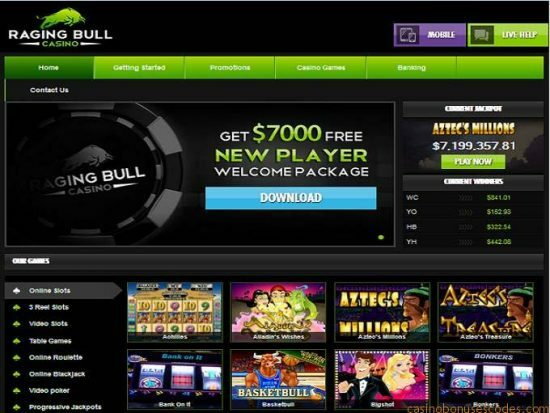 Raging bull is a gaming platform that allows players from US to enjoy the games. The currency used is dollar and only language is English. You can enjoy safe transaction with them as they have 128 bit encryption technology. You are allowed to withdraw a minimum amount of $100 and the maximum withdrawal limit is $2500 per week. Cash out time will be instant if you use e-wallets, otherwise it will take 5 to 10 business days.